It’s Sunday morning. Oksana is at work on her MBA class – I’m asleep on the couch after misjudging when to get out of bed – when the power goes out. Her homework on hold, she joins me in napping on the couch. Yesterday, I read in the paper that the cause of the power outage was an eagle flying into a power substation. The eagle had been carrying a “deer head,” scavenged from the local landfill. Today must be a slow news day, because the story has been picked up by the AP Wire and is making the rounds online. I’ve seen it on at least two popular blogs. Why does this fascinate people so? Is it because a bald eagle fried? Are people imagining that it was hauling the equivalent of the deer bust you’d see mounted above the mantle in someone’s den? Or is it just a slow news day? Actually, I think it has more to do with the Alaskan mystique. For the people who live here, Alaska is pretty normal. With only 30,000 people, Juneau’s small by Lower 48 standards, but that doesn’t mean we’re the frontier town that resides in most people’s imagination. No igloos, dogsled teams, or rampaging grizzly bears here. No friendly moose roaming the streets, at least in Juneau, a la Northern Exposure. Tourists fresh off the cruse ships may not bat an eye at a Hummer driving down the road — it might fit in with their preconceived notions of an Alaskan vehicle — but I think most would do a double take when one of the local Dodge Vipers passes by. Sure, their skewed perception of Alaska does have some basis in fact. Salmon, halibut, and king crab practically jump into our frying pan, waves from calving glaciers are a real cause for fear and panic, humpback whales frequently collide with boats, hungry bears break into homes for food, the aurora borealis is out every night, we never see the sun in winter, and bald eagles fly off with the pets and infants of the unwary. Yeah, actually, not so much. But tell a tourist in the street that you live here, and they’ll probably ask you about one of those things. And where they can exchange their American dollars. 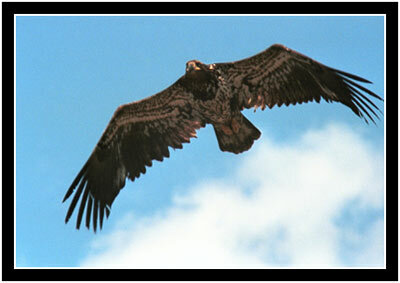 When I heard that an eagle was the cause of our power outage on Sunday, I mentally shrugged and moved on. Happens all the time. Take a look at the Alaska Electric Light and Power website: Eleven outages in 2006 were caused by “animals;” many previous incidents are listed as “Bird,” “Squirrel,” and one rogue “Raven.” (It looks like they stopped specifying the type of animal sometime in 2003. You can bet that at least some of the “animals” listed now are “eagles.”) So why haven’t the AP Wire and the Blogosphere run with this story before? Maybe it’s the deer skull. My vote’s on the slow news day. I wasn’t too surprised to see this posted on BoingBoing.